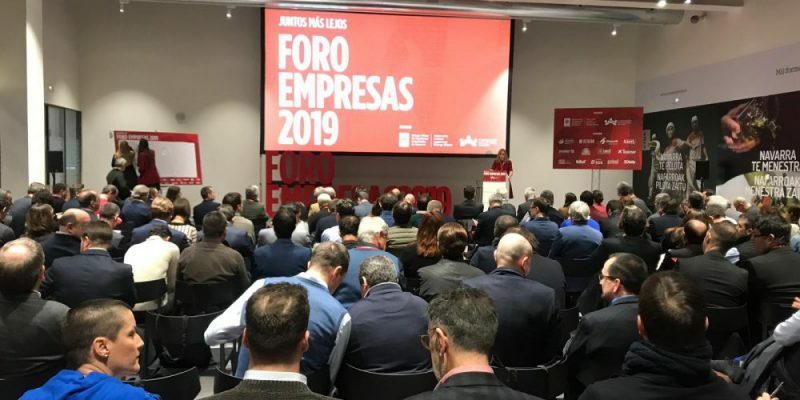 200 Directors gathered at the 2019 Business Forum organized by Fundación Industrial Navarra. “To be the reference Industrial Community in Navarra”. Elena Alemán, manager of the Foundation announced to the audience this objective of the entity that also, in 2019, will focus on Digital Transformation. To this end, the Association of Industrial Engineers of Navarra, an umbrella entity of the Navarra Industrial Foundation, has been recognized by the Ministry of Economy and Business as the ‘Official Office of Digital Transformation in Navarra’, and plans an ambitious program of 132 activities focused on three major areas: Strategy, Technology and Training. This was explained by Elena Alemán, during the celebration of the 2019 Business Forum that took place in Navarra Arena. Addressing them, Alemán said that “we are committed to a new business model that seeks to offer solutions based on digitization and that puts the customer in the center”. Hence, after reviewing the work done last year, stressed that “the digital transformation will be very important in 2019” so he encouraged those present “to return to the beginning and think to devise new projects and move forward.” For this, the Industrial Foundation of Navarra will give them support in advice, strategy, change and technology. Likewise, Elena Alemán confirmed that two working groups will be created: one for SMEs and the other for tractors and multinationals to better adapt to the specific demands presented by each one of them “and that they can evolve in an appropriate manner”, he indicated. . Finally, he pointed out that another objective of the entity, founded in 2014, is to increase the number of associates in 20 companies per year while seeking to maintain the various lines of work that he has carried out in recent years such as the different work innovation, strategy, continuous improvement, digital transformation, industrial safety and occupational health and human resources) as well as specific forums such as those dedicated, for example, to employment or the ‘Safety Navarra’ focused on occupational safety, among others. Previously, the day included the intervention of executives such as Francisco Ceberio, managing director of Frenos Iruña; Itziar Maestrojuán, general director of Anteral; David Iranzo, CEO of GM Global Solutions o; the manager of Lizarte, Óscar Huarte. All of them have analyzed some of the experiences they have developed in their companies in the year that has just ended. For their part, after the awards ceremony, attendees participated in the masterclass ‘The Challenge of Motivation in Professional Work’ that has been run by Jesus San Miguel, medical director, specialist in Hematology and Hemotherapy of the University of Navarra Clinic as well as a networking lunch and a visit to the facilities of the Navarra Arena Pavilion with which the third edition of the Business Forum was concluded under the theme: “Together farther”.